We ship orders Mon – Fri as orders are received. We do not ship on holidays or closure days. Most items are shipped with Canada Post. Regular parcels ship within two to three business days within Canada with a base rate of $15 and $22 to the USA. Shipments found to be over base rate due to size or delivery location are subject to additional shipping fees. If an additional shipping fee is required an e-mail will be sent to the purchaser and a PayPal invoice for the additional shipping fee. Items purchased will not be sent until additional shipping fees are paid in full. Please be patient as all couriers are experiencing delays with the ending of the Canada Post strike and the holiday season. We work diligently with all couriers to achieve the best delivery times. Please consider other shipping options below. 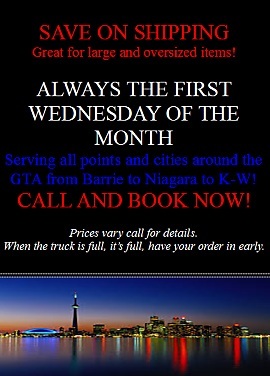 For faster shipping or to use a different courier please call 1-519-878-3353. Extra fees apply for this service. Extra fees are billed through Paypal’s secure invoicing system. Our next GTA delivery day is May 1st, 2019. Arrangements are made by phone for this service. Fees are specific to location and items ordered. GTA delivery fees are billed through PayPal’s secure invoicing system. GTA is the Greater Toronto Area. We also cover locations from Barrie to Niagara to London on this day. London, Ontario & area delivery service available every Friday. Arrangements are made by phone for this service. Fees are specific to location and items ordered. London delivery fees are billed through PayPal’s secure invoicing system. All shipping and delivery fees must be paid in full before orders are sent. For any questions you may have, please contact us at canadacatalyst@gmail.com.